Many thanks for Mike Gennaria and Housetrends Magazine for this wonderful feature. We are thrilled to be celebrating our 25th anniversary this year. 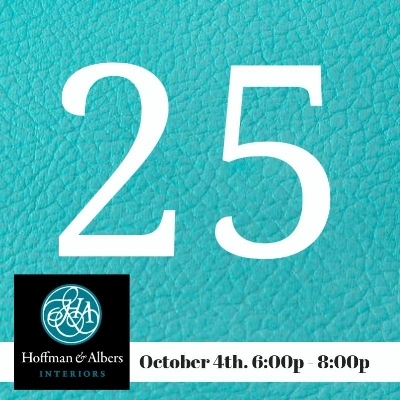 ‘Hoffman & Albers Interiors, a full-service design firm and furniture store located in Blue Ash, Ohio, is set to celebrate its 25th anniversary. Coinciding with this milestone will be a sale that kicks off with an open house on October 4 from 6-8 p.m. The kickoff event will include a trunk show of the newest fabrics, area rugs and trims, surprise giveaways, refreshments and light bites, live accessory switches demonstrating the impact of accessory details and drawings for holiday tablescapes. With 25 successful years in business, we wanted to learn more. The following is a Q&A with owner Ann Hoffman. Q: What business advice have you received that has stuck with you? A: Honesty, integrity and establishing long-lasting relationships with clients and everyone involved in the business. Your reputation depends on all of those factors. Q: In a world where many businesses and corporations are owned and operated by men, your team at Hoffman & Albers Interiors is largely female. What does that mean to you, to be a female entrepreneur and also to work with a team of female designers? was primarily male, including factory reps, bankers and landlords. It made us work harder and more purposefully. My husband, Jack, was hugely instrumental in advising and establishing business and banking relationships and offering unending support to our business plan. We’ve had a greater sensitivity and insight to our clients’ needs. “Those women” have survived a challenging 25 years in business! Q: What are some past design trends (from any era) that you would love to see again? A: Neoclassical, Country English and Country French. ! Q: What are some current design trends that excite you? A: Clean, timeless and classic design. You can involve some trends, but only if it is appropriate and it excites your client. Q: What are some misconceptions about using an interior designer? A: That designers are expensive. If you select the correct designer, he or she can actually save the client money and create a unique and personalized space. Q: What is Hoffman & Albers Interiors looking forward to in the months and years ahead? A: Staying in the forefront of interior design service in the greater Cincinnati area.